A rundown apartment block for policemen and soldiers in the border town of Bukoba. This was in the Great Lakes region that borders Tanzania and Uganda, one of the areas where HIV/AIDS first appeared in the early eighties. 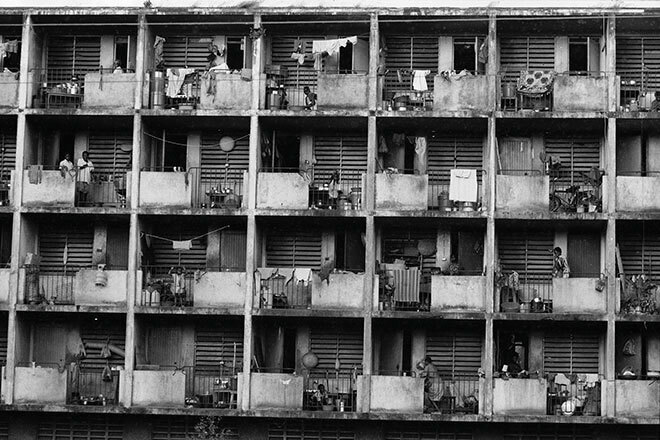 This is a collection of pictures of daily African life, taken throughout the 1990s in South Africa, Tanzania and Zambia. 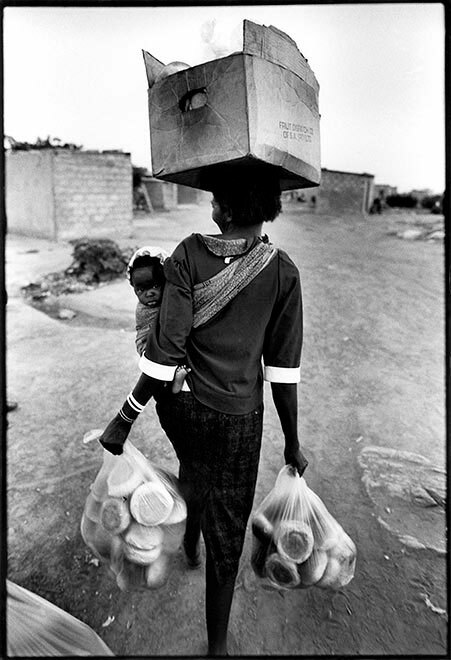 While some come from specific stories, the majority were taken while I was working on my Broken Landscape project, to document the impacts of HIV and AIDS across Africa. Many of the situations I was photographing at the time were difficult and emotionally intense and, to find a counterpoint, it became important to me to photograph some of the more ordinary aspects of daily life. 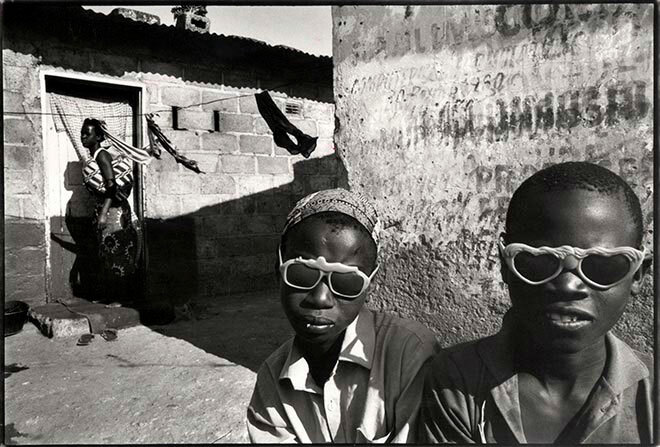 Even these images, on reflection, contain multiple undercurrents of the challenging realities that faced African people at the time. 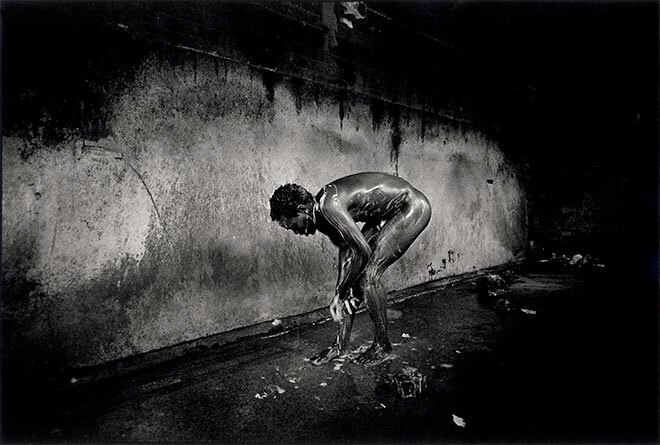 A migrant worker at a hostel in Soweto washes himself. 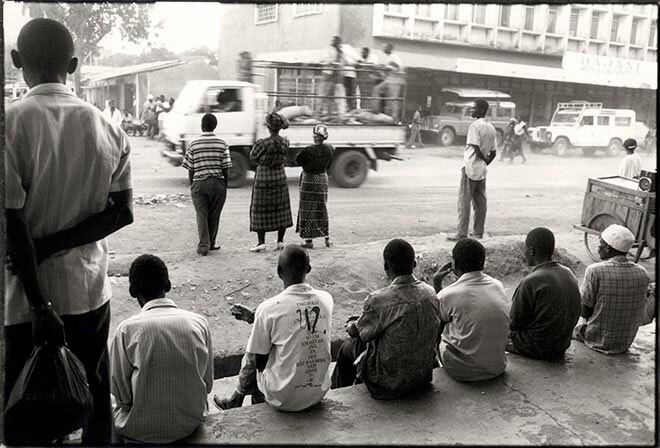 The migrant labour system, where men leave their families for long periods of time, was a crucial factor in the spread of HIV in sub-Saharan Africa. Children in Misisi compound in Lusaka, Zambia. This was one of the poorest areas in Lusaka. 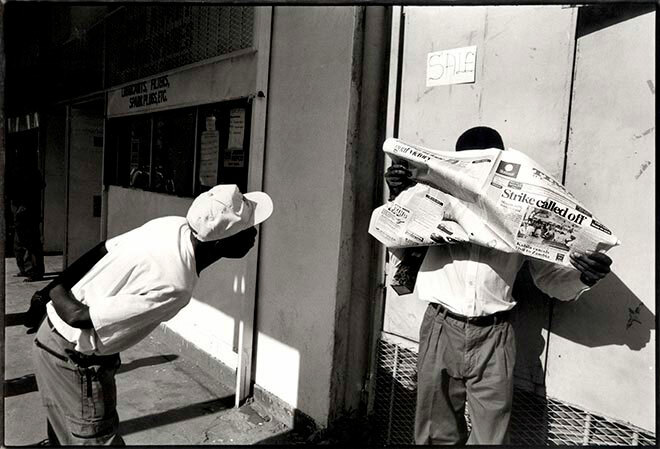 Two men read the same newspaper in Lusaka, Zambia. The country has a lively newspaper industry. A street corner in Mwanza, Tanzania. As a busy trucking route, the area had high levels of HIV. A woman carries bread into Misisi compound, Lusaka, which she will sell for a small profit. 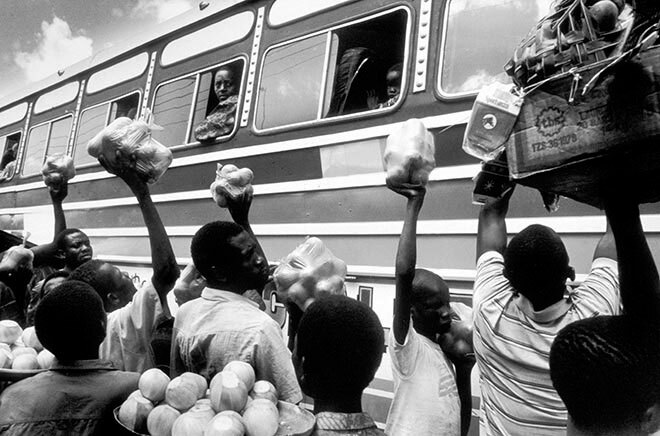 Hawkers try to sell products to passengers at a stopping point between Dar es Salaam and Tanga, Tanzania. 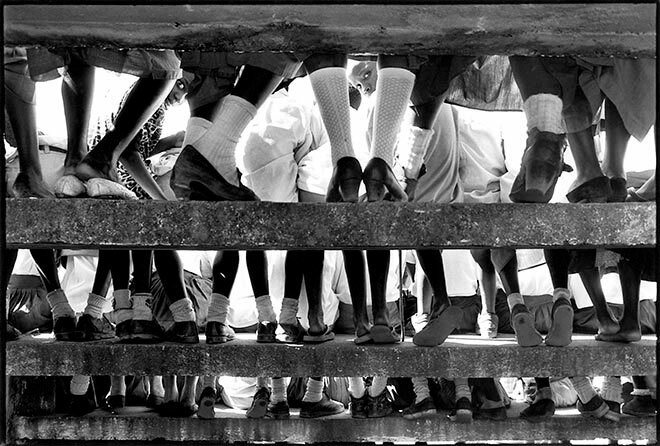 Children at the stadium in Mwanza, Tanzania, celebrate International Day of the African Child. 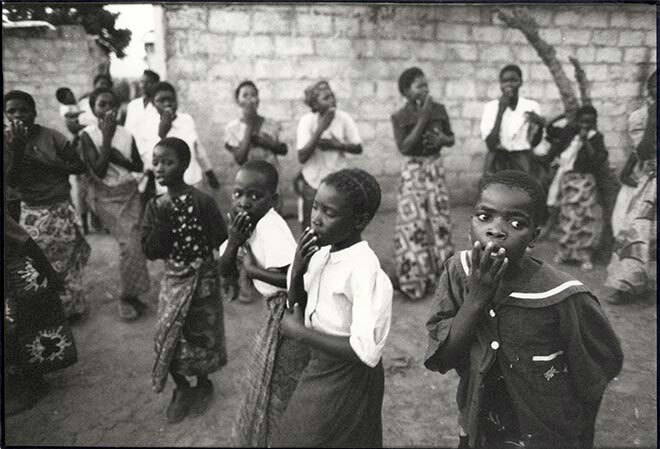 The Catholic Church choir practice in Misisi compound, Lusaka, one of Zambia’s poorest areas. 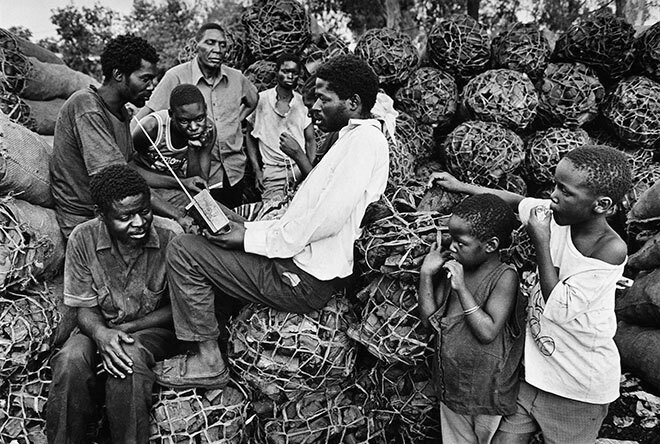 A group of charcoal burners in Mandevu Squatter Camp, Lusaka, listen to their Zambian national soccer team play against Morocco on a radio. They lost this World Cup qualifier. 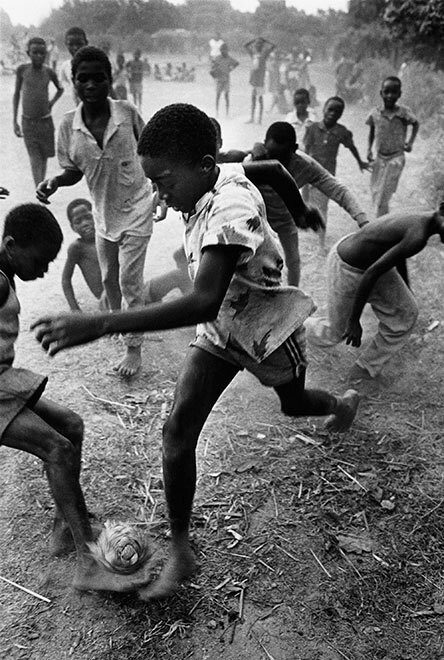 A young soccer team in Kalingalinga compound, Lusaka, practice heading technique during a coaching session. This self-constituted team imitated many of the coaching exercises that were practiced by the national team. The ball had been made from plastic bags, torn into strips and then woven together. 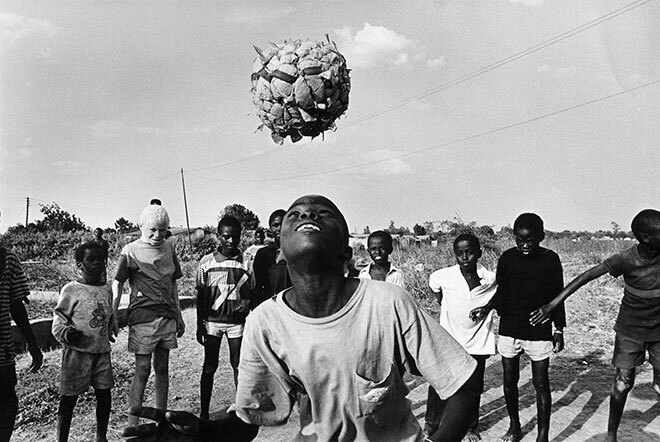 Children play soccer with a homemade ball in Kawama Squatter Area outside Mufulira, in the Copperbelt region of Zambia. This was a poor area occupied by people not employed by the mines, but who had flocked to the area in search of work.